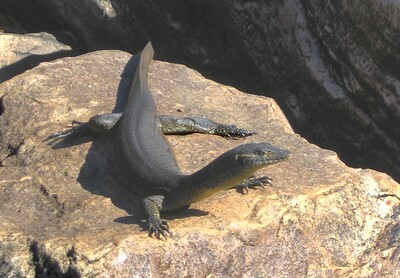 Monitor lizards (Goannas) in the Kimberley Region? 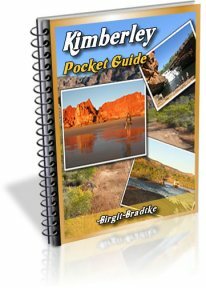 We're planning a new 2 month trip to Australia (we're Belgian), and the Kimberley Region is most probably one of the regions we'll want to visit. 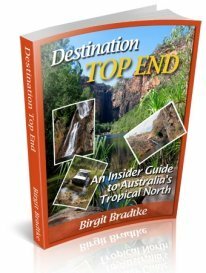 Being huge monitor lizard (goanna) lovers, we were wondering about reptilian wildlife in the Kimberley Region and more specific near the Gibb River Road. Re: Monitor lizards (Goannas) in the Kimberley Region? Well, we have lots and lots of reptilian wildlife, but what you will see depends very much on the time of the year. 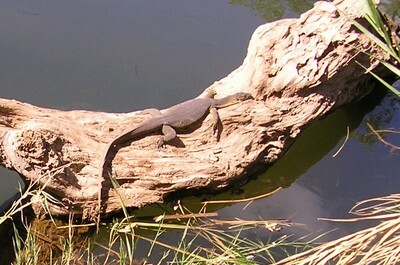 There is a page about goannas/monitor lizards on my other website. Most of the photos on it were taken from my veranda. Everything I say in the answer there is true for the Kimberley as well. And you should most definitely see some water monitors at the swimming holes. They are always hanging around, sunning themselves on rocks and logs. Because it is so easy for them to escape into the water at there very last second, they usually let you get very close. 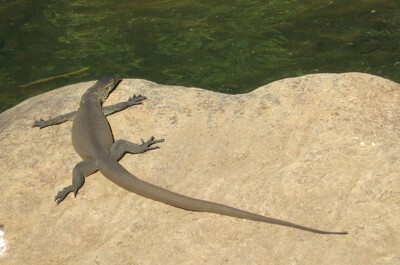 The one in the photo below was on the Mitchell Plateau, at one of the pools on the walk to the falls. He walked right over my feet. Didn't care at all. 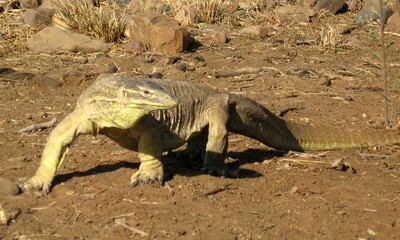 We also have many Frilled Neck Lizards and Blue Tongue Lizards. You're unlikely to see Blue-tongues because they are not usually out in the open, but you may get lucky and see the odd Frilly. Comments for Monitor lizards (Goannas) in the Kimberley Region? 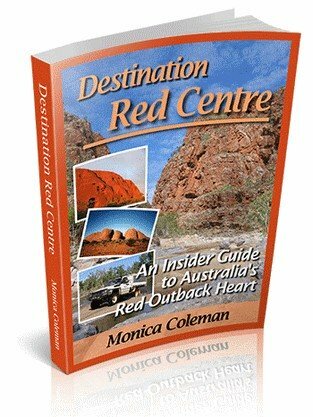 I read your excellent site on goanna's (hadn't seen that one yet). 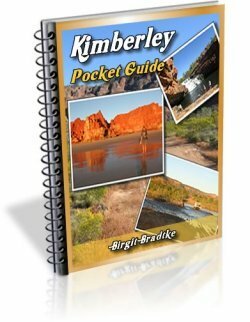 We were thinking of visiting the Kimberley Region somewhere in june, but on your goanna site you explain that they go into hibernation during that period. I read through my goanna pages on my other site and couldn't find anything I said about hibernation... Are you sure you saw that on my site? I don't think they go into serious hibernation up here. It's too warm all year round. And they're slower when it's cool :-). The two photos above of the water monitors were taken in early June. I think if you do have some time to spend here, and get off the beaten track a bit and do some camping and hang around the water holes and pools, you will definitely see some goannas. He looked a little too interested in me! Thank you we used your page for identification. We went for a hike to a pool in Mirima Nat Park, as we were having a relax in the water, I notice this wet thick stick that looked out of place on the rock (I didn't have my glasses on). On closer examination I realised it was a lizard. At first I thought it was a cross between a race horse and a bungarra. When out of the blue it ran across the sloping rock face and plop into the water. I thought it had fallen in. It sunk like a stone! I thought I'd best assist it as I thought it would drown, well I couldn't find it. Later it reappeared on the rock. On closer look I noticed the tail was more flattened and then I was concerned it might be a crocodile (still no glasses) but the yellow rings on its underside and lack of snout, well not long enough for a croc. At this point it turns and really looks at me, my granddaughter squeals and jumps out of the water, this lizard is still looking, I mean neck out looking at me and then launches into the water towards me, lucky I was a respectful distance away from it but I'm close enough to seem it swim to the bottom. I lose sight of it but my granddaughter on the shore announces that it had popped its head out from under the large boulder on the edge of the water. This little fellow would have been about 60-70cm. I've heard that there were a lot more in the area but they have been decimated by the cane toad. We were so excited to have seen him, especially in the water.